Sweet potato is a nutricious and versatile food that can be used in a variety of ways. It can substitute regular potatoes in almost any recipe, although, for its distinctive sweeter flavour, some combinations are particularly successful when this variety is employed. It can be found all year around, but it belongs tipicallyto the cooler months. 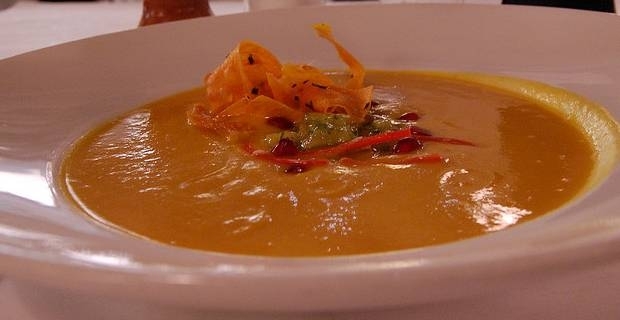 So, why not try our favourite of the many heart warming sweet potato soup recipes? Not only our favourite, but also of many big chefs the world around, the butternut squash/ sweet potato combination is a winner when it comes to serving a creamy, distinctively sweet and nutty flavoured soup. Indeed, there are many sweet potato and butternut squash soup recipes around, but this one features a drizzle of honey, parsnip and ginger that work wonderfully in bringing out and balancing by contrast the tasty qualities of our main ingredients. On the other hand, some carrots will add to their distinctive orange colour. 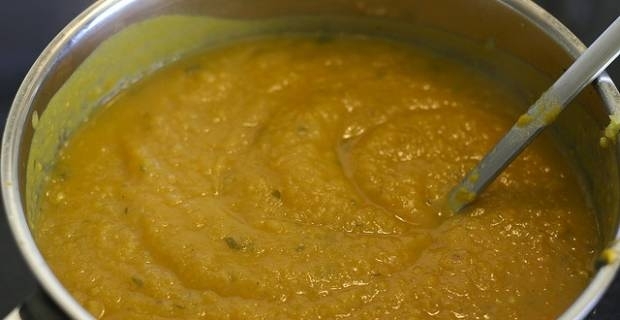 You may wish to add to our roasted butternut squash and sweet potato soup your favourite spices or ingredient, for a personalized taste. Preheat the oven to 200c/400F/Gas mark 6. Place the vegetables on a baking tray, drizzle with oil and honey. Roast for 30-40 minutes, or until tender and starting to get brown. Pour a little oil in a high sided pan, heat on a medium temperature. Add the sliced onion and crushed garlic. Stir and shallow fry until soft, then add the ginger, mix it in well, add half of the vegetalbe stock. Bring to boil, then simmer for 2-3minutes. Add the roasted vegetables. Mix in well, then pour the mixture into a liquidizer or start blending with an hand held food blender. Pour in slowly the remaining stock and blend thoroughly Heat up again before serving. Wash the vegetable thoroughly: you can choose to chop them without peeling as their skin, especially the thick sweet potato skin, is the richest in essential vitamins and minerals, and soften when baked. Even the skin of the butternut squash is completely edible, just like its seeds are.